At the Schultz’s households, they do a lot of cooking. 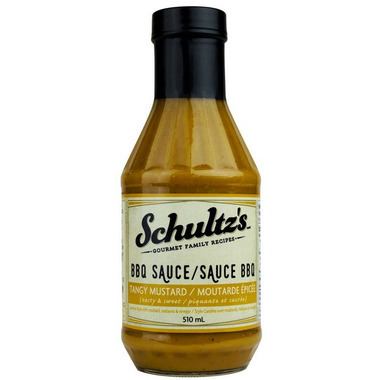 So much so, that they had to create their very own BBQ sauces to perfectly complement their growing list of family recipes. Paying homage to much-loved regional flavors and traditions, you'll want to put this delicious sauce on everything! Ingredients: Water, Brown Sugar, Distilled Vinegar, Mustard Seed, Tomato Paste, Worcestershire Sauce (Distilled White Vinegar, Molasses, Sugar, Water, Salt, Onions, Anchovies, Garlic, Cloves, Tamarind Extract, Natural Flavorings, Chili Pepper Extract), Sugar, Lime Juice Concentrate, Apple Juice Concentrate, Salt, Molasses, Spices, Dehydrated Garlic and Onion, Turmeric, Natural Flavor.